The Georgia Tech Library is an academic library that serves the needs of students, faculty, and staff at the Georgia Institute of Technology. The library consists of the S. Price Gilbert Library and the Dorothy M. Crosland Tower. In addition, the library is connected to and manages the Clough Undergraduate Learning Commons. The Association of College and Research Libraries (ACRL) recognized the library's effort to reinvent itself by awarding it a 2007 Excellence in Academic Libraries Award. The Georgia Tech Library is located in the center of campus and is open 24/7 as of the Fall term of 2014. Among the Library staff members are subject specialists in 35 disciplines. Judge Sterling Price Gilbert donated a large sum of Coca-Cola stock to Georgia Tech with the stipulation that the proceeds be used to construct a new library. He later donated more funds to the cause. Ground was broken for the S. Price Gilbert Memorial Library on July 5, 1951, and the building was dedicated on November 21, 1953. The Graduate Addition to the library was opened in 1969, and was renamed Crosland Tower in 1985. Dorothy M. Crosland was the long-time head librarian; initially appointed as Assistant Librarian in 1925, she was promoted to Librarian in 1927 and Director of Libraries in 1953, a title she would hold until her retirement in 1971. Paul M. Heffernan, then a professor in the Georgia Tech School of Architecture, was the lead designer on the S. Price Gilbert Library. In 2017 a large-scale renovation project began with Crosland Tower to modernize it, opening up the space inside and changing the veneer to more curtainwall instead of solid brick to allow more light inside. The Crosland project was finished prior to the start of the Spring 2019 semester. Following its opening, a renovation project began on the S. Price Gilbert Library. The total renovation is expected to be completed in the Spring of 2020. The Library’s collections include over 2.4 million books, bound periodicals and serials, including about 900,000 government documents, 2.7 million technical reports, over 197,000 cartographic materials, more than 240 online databases, over 29,000 electronic books and 39,000 e-journals. There is a separate Architecture Library which houses over 45,000 books. The Archives and Records Management department preserves and provides access to the history of Georgia Tech, and includes over 4300 rare books emphasizing the history of science and technology, a 4000-volume science fiction collection, photographic collections, and approximately 1000 manuscript collections. In mid-late 2015, the library moved 95% of its print collections to an off-site service center as part of a partnership with Emory University. This Library Service Center was opened and dedicated in 2016. The Library's two information commons, West and East Commons, provide computer hardware and software geared to the needs of students, including a multimedia center and computers specifically set up for group study, known as the "collaborative computing" desks. The commons areas are a component of the partnership between the Library and the Office of Information Technology (OIT) which has also resulted in the creation of the Resource Center in the Library providing technology support, academic advising, and tutoring. The Library’s digital initiatives include the institutional repository, SMARTech, which captures, stores, indexes, preserves, and redistributes in digital form the intellectual output of the Institute’s students, faculty, and researchers. Another digital service is [email protected], which provides assistance publishing electronic books, journals, and conference proceedings; hosting of conferences, symposia, and lecture series, and captures instructional materials and multimedia. ^ "Library". Georgia Tech Fact Book. Georgia Institute of Technology. Retrieved 2011-11-10. ^ "About Us". Georgia Tech Library. Retrieved 2011-11-10. ^ "ACRL Excellence in Academic Libraries winners announced". American Library Association. 2007-01-30. Retrieved 2007-08-13. ^ Pon, Corbin (2007-02-16). "Tech wins Library of Excellence award". The Technique. Archived from the original on 2007-09-29. Retrieved 2007-08-13. ^ "Library and Information Center". Campus Map. Georgia Tech Alumni Association. Archived from the original on 2007-08-11. Retrieved 2007-08-13. ^ "Georgia Tech Library: Hours". Retrieved 2007-12-26. ^ "Subject Librarians". Georgia Tech Library and Information Center. Retrieved 2007-08-13. ^ "Philanthropy at Tech". Georgia Institute of Technology. Retrieved 3 June 2016. ^ Li, Lisha; Altamirano, Isabel; Finn, Bette (2017). "History of the Georgia Tech Library, with Emphasis on the Crosland Era". Retrieved July 20, 2018. ^ "Dorothy M. Crosland Papers". Archives & Records Management. Georgia Tech Library. Retrieved 2011-06-06. ^ Ann Vidor; Jean Price, Virginia Kinman. "A History of the Georgia Tech Library" (PDF). University of South Carolina School of Library and Information Science. Retrieved 2011-06-06. ^ Kent, Allen (1993). Encyclopedia of library and information science, Volume 52. p. 108. ISBN 0-8247-2052-0. Retrieved 2011-06-06. ^ "Heffernan Design Archives". Georgia Tech Library. Retrieved 2011-11-10. ^ "Library Renewal Project Moves ForwardÂ". www.news.gatech.edu. Retrieved 2019-01-26. ^ ""Empower. Enrich. Advance" (Library fact sheet)" (PDF). Library and Information Center, Georgia Institute of Technology. Archived from the original (PDF) on 2008-05-28. Retrieved 2007-12-26. ^ "Architecture Library". Georgia Tech Library and Information Center. Archived from the original on 2011-07-19. Retrieved 2007-08-13. ^ "Georgia Tech Archives and Records Management". Archived from the original on 2007-05-20. Retrieved 2007-08-13. ^ Kessler, Alex (2011-03-03). "Archives delve into global, Tech history". The Technique. Retrieved 2011-03-05. ^ "Georgia Tech Photograph Collection". Georgia Tech Archives and Records Management. Archived from the original on 2007-05-18. Retrieved 2007-08-13. ^ "Improved Services for Georgia Tech Users". Retrieved 2014-12-17. ^ "Library Service Center of Emory University and Georgia Tech". Archived from the original on 2014-12-17. Retrieved 2014-12-17. ^ Wallace, Lance (2016-03-17). "Emory, Georgia Tech Dedicate Joint Library Service Center". Georgia Tech News. Retrieved 2019-03-18. ^ Cuneo, Joshua (2007-03-31). "Library unveils Resource Center". The Technique. Archived from the original on 2007-09-29. Retrieved 2007-08-13. ^ "SMARTech". Georgia Tech Library and Information Center. Retrieved 2007-08-13. ^ "[email protected]". Georgia Tech Library and Information Center. Retrieved 2007-08-13. Wikimedia Commons has media related to Georgia Tech Library. Gerald Wayne Clough is President Emeritus of the Georgia Institute of Technology and former Secretary of the Smithsonian Institution. A graduate of Georgia Tech in civil engineering, he was the first alumnus to serve as President of the Institute. 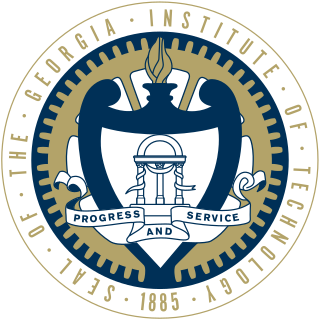 This list of Georgia Institute of Technology faculty current and former faculty, staff and presidents of the Georgia Institute of Technology. The Marcus Nanotechnology Building (MNB) is a Georgia Institute of Technology facility. The building was constructed on the site of the Electronics Research Building, the former home of GTRI's Information and Communications Laboratory. It was opened on April 24, 2009, as the Marcus Nanotechnology Research Center, a name it held until October 2013. Lyman Hall was a professor and president of the Georgia School of Technology. He is perhaps best known for bringing what is now the School of Materials Science & Engineering to Georgia Tech. 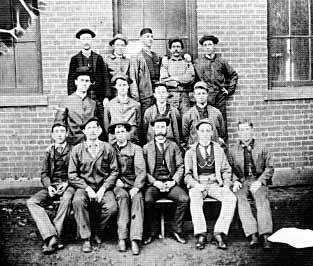 Hall's administration also introduced degrees in electrical engineering and civil engineering in December 1896, textile engineering in February 1899, and engineering chemistry in January 1901. Hall died in 1905, reportedly due to the stress of fundraising for a new chemistry building which now bears his name. The Scheller College of Business at the Georgia Institute of Technology was established in 1912, and is consistently ranked in the top 35 business programs in the nation. Isaac Stiles Hopkins was a professor and the first President of the Georgia Institute of Technology (1888–1896) as well as pastor of the First Methodist Church in Atlanta, Georgia. George Waldo Woodruff was an engineer, businessman, and philanthropist in Atlanta, Georgia. He attended the Georgia Institute of Technology in 1917 and gave generously to both his alma mater and Emory University, including what was at the time the single largest donation ever to a school, $105 million to Emory University in 1979. James Emory "Jim" Boyd was an American physicist, mathematician, and academic administrator. He was director of the Georgia Tech Research Institute from 1957 to 1961, president of West Georgia College from 1961 to 1971, and acting president of the Georgia Institute of Technology from 1971 to 1972. The main campus of the Georgia Institute of Technology occupies part of Midtown Atlanta, primarily bordered by 10th Street to the north, North Avenue to the south, and, with the exception of Tech Square, the Downtown Connector to the East, placing it well in sight of the Atlanta skyline. In 1996, the campus was the site of the athletes' village and a venue for a number of athletic events for the 1996 Summer Olympics. The construction of the Olympic Village, along with subsequent gentrification of the surrounding areas, significantly changed the campus. Susan Keene Nutter was the vice provost and director of the NCSU Libraries where she worked for thirty years. While she was director, in 2000, NCSU Libraries received the first Association of College and Research Libraries Excellence in Academic Libraries Award. She was instrumental in the planning, development, and construction of NCSU’s Hunt Library. Called her "signature accomplishment," it was awarded the Stanford Prize for Innovation in Research Libraries in 2014. Before Susan's tenure NCSU Libraries "ranked near the bottom among North American research libraries." In 2016 they won the IMLS National Medal for Museum and Library Service which Nutter accepted on the libraries' behalf from Michelle Obama at the White House.